Errabelli switches over to TRS, says distrust and discontent in Telangana TD. 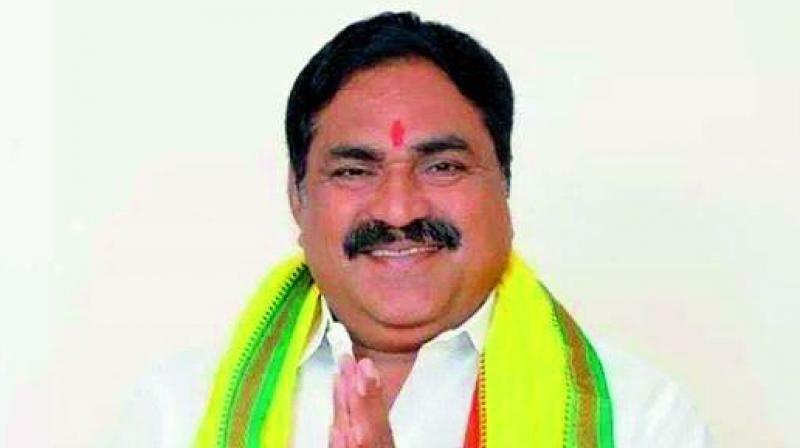 Telangana TD MLA Errabelli Dayakar Rao who defected to TRS. Hyderabad: The Telangana TD on Wednesday got its biggest shock since the formation of Telangana state, with its Legislature Party leader Errabelli Dayakar Rao, along with Rajendernagar MLA T. Prakash Goud, deciding to join the ruling TRS. Indications are that two more MLAs will follow suit, and may take steps to formally merge the TDLP into the TRS so that they do not attract the Anti-Defection Law. On Wednesday, irrigation minister T. Harish Rao, who had played a key role in the defection of the MLAs all these days, rushed straight to New MLA Quarters at Adarshnagar in Hyderabad from Narayankhed, and was closetted with Mr Dayakar Rao and Mr Goud. The game plan of the TRS and the TD MLAs who defected is quite clear — they want to merge the entire TDLP into the TRS so that the TD doesn’t exist in the TS Assembly, a repeat of what took place in the Legislative Council last year. Of the 15 MLAs elected on TD tickets in 2014, till Tuesday, seven had crossed over to the TRS, the number reaching nine with the defections of Mr Dayakar Rao and Mr Goud. If as rumoured, one more TD MLA switches over to the TRS, these ‘defectors’ can claim that they form two-thirds of the TDLP strength, a prerequisite to approval of the merger plan. The ‘defectors’ will meet, adopt a resolution declaring merger of the TDLP into the TRS and send it to the Assembly Speaker, which he is expected to approve like he did it in the case of two BSP MLAs (including minister Indrakaran Reddy) who merged the two-member party into the TRS in 2014.